Rock’s formative stages can sometimes seem a bit confusing when looking back seventy years as of this writing in 2017, and I’m sure may have been even more so if you were around during that time itself, when the bits and pieces you heard of the emerging format were somewhat varied, far-flung and even at times unsure of themselves so to speak. While you could tell that Roy Brown’s Good Rocking Tonight captured a certain new and unique sensibility you might not have really known what to make of it. Had that been all that came out around the time in that vein it might’ve seemed to be something of a curiosity, not the beginning of any larger movement. More and more records that followed by various artists seemed to fit into the growing picture, but then again, as stated here before, you could’ve gone back a few months and found a few more that conceivably fit as well. What – if anything – did it all add up to? The answer came soon enough, for what separated all of this joyous noise from the previous, and many subsequent, forms of experimentation in music was how different strains of that experimental nature all came together so quickly and joined forces to build towards something much greater. It certainly wasn’t planned, we know that, but the resulting spirit that enveloped all of it as the last weeks of 1947 rolled up became a force unto itself, lifting up a certain type of record, drawn from disparate influences but amazingly fitting together like pieces of a puzzle, and the momentum generated by this groundswell carried them all in a fast-growing tidal wave of generational and cultural enthusiasm. Soaring highest as this movement took off were a group from New York called The Ravens and like the story of Noah’s Ark where a raven and a dove were sent out after the flood to seek land, these Ravens became the first artists to perch on the rock ‘n’ roll mountaintop. The Ravens are, without question, the first rock “group”, as in vocal group, and as such were vital in expanding the boundaries of the overall rock style just as it was getting started. I don’t think the importance of this can be overstated. ANY musical development is at risk for limiting its appeal and influence when – whether intentionally or just circumstantially – confining itself to a narrow and unchanging definition. Had The Ravens, or another group like them, not come along in the formative stages of rock’s emergence would the entire genre had survived for very long? It may sound ridiculous but that’s a fair question to ask. 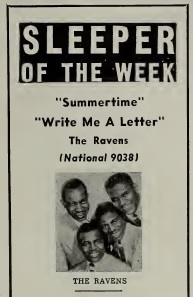 That’s not to say The Ravens popularity itself was what elevated rock as a whole, though it certainly helped – as Write Me A Letter was the first actual hit, full stop, on the national Billboard charts for the style as a whole – but rather that their presence assured the new style of music had much needed diversity right from the start. Without that open tent policy of inclusion being established so early might rock have wound up setting rigid borders that kept it restricted to only that which conformed to whatever took hold first? Say only derivatives of Roy Brown-styled gospel-esque jump blues? Or perhaps, as we’ll see soon enough, the growing dominance of the tenor sax instrumental might have turned rock ‘n’ roll into simply a designation for just that particular brand of musical mayhem and nothing else. If either became the case then rock as the cultural force we know would never have come about. It simply wouldn’t have lasted long enough to, as the popularity of any single strain of something is always destined to have a relatively brief time limit. But by the mere arrival on the scene of The Ravens, a group offering a distinctive new sound that somehow meshed perfectly with those impassioned Brown sides and the honking squealing workouts of crazed horn players that soon followed, the boundaries of rock grew broader and more inclusive right away. As such rock didn’t allow itself to be seen as merely a one note musical fad or something easily passed off as a temporary craze but rather it showed itself to be the evolving musical voice of a generation seeking liberation from confinement, a clear and radical break from the past and a jumping off point for a different brand of earthy musical adventurism. The black secular vocal group approach since the late 30’s was defined primarily by two outfits, The Mills Brothers and The Ink Spots. In many ways those groups would continue to exert influence on the emergence of the rock vocal groups for another decade but the differences between their ilk and those who followed under the rock ‘n’ roll banner were striking and unmistakable. Those older groups were more refined, sedate, mannered and had a polished style that allowed them, and in fact was often designed specifically, to cross over into the mainstream pop marketplace. In other words while they were black groups in terms of personnel they were playing under decidedly white ground rules of acceptance. Their phrasing, their precise enunciation, the way they shaded and rounded the edges off their harmonies, certainly the subject matter they chose and the musical accompaniment itself, all followed the game plan of the dominant white musical establishment. That’s not in any way to diminish them or their achievements but rather to point out just what was required to BE universally accepted at the time. They were massively popular within black communities all the same and not just because they climbed that seemingly unscalable mountain of mainstream acclaim which naturally was the source of great pride within a community not used to seeing such visible success, but also because they were just damn good regardless of what standards were being used to judge them. But when rock came along some years later the far more rhythmic descendants of The Inks Spots and Mills Brothers began to emphasize and, as we’ll soon see, exaggerate their unique (read: black) attributes in their deliveries, rather than mostly concealing them, or at least downplaying them, as those earlier acts had often been forced to do. This shift in approach immediately set the next generation of vocal groups apart as offering something different, daring and exciting. No group embodied all three of those attributes more than The Ravens. 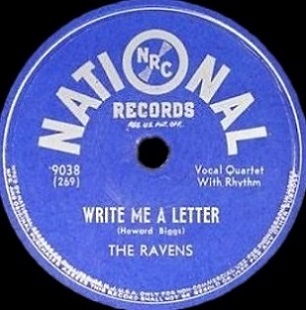 The Ravens had already cut a handful of records for the Hub label in 1946 including a song that would become a legitimate hit when re-released later on, but their real breakthrough came when Ben Bart, who’d later go on to manage and help guide James Brown’s career, got The Ravens signed with National Records where in the spring of 1947 they cut a radical interpretation of “Ol’ Man River”, the Oscar Hammerstein composition from the musical Show Boat. Right away you knew these guys were different. There was a playful bounce to their version embodied by the backing vocals, “Do-do-do-doot!”, over which bass singer Jimmy Ricks nimbly stepped out for the impossibly low lead part, something that was downright shocking in its audacity at the time. Bass singers simply did not do such things. In fact, recording technology almost wouldn’t ALLOW bass singers to sing so low, as the resulting groove cut by the lathe on the 78 RPM Records would be too wide to prevent the phonograph needle from jumping out when played so all bass vocalists were frequently required to hold back, lest they risk ruining the physical platter it’d be sold on. The Ravens ignored this industry edict and proudly celebrated their stylistic ingenuity, using it as their calling card. In live venues the group would bring the house down when they’d switch in mid-song from Maithe Marshall’s unearthly high tenor (almost soprano) to Ricks’s ball dragging bass and they were already earning a good deal of notoriety for themselves as a result. By the fall The Ravens had become pretty well known, especially around New York City (Ol’ Man River topped the Harlem Charts in Cash Box for more than a month in late summer in fact), but still were at least marginally at risk of being seen as, or turned into, a novelty type act because of the uniqueness of Ricks’ bass leads. In order to prevent that they needed to keep the musical standards high yet at the same time find a way to take advantage of their greatest attribute which was the dichotomy between Marshall’s exquisite tenor and Ricks earthy bass. What they really needed was an audience who would see them as something more than a gimmick. Rock ‘n’ roll, in other words, was tailor made for them. The record sounds at least five years ahead of its time. You could conceivably have released it in 1952 (and five years is an eternity in rock evolution) and it wouldn’t seem the least bit out of place. Everything that the vocal group style in rock would become famous for over the next decade was present in Write Me A Letter. A little more laid back here perhaps, but already fully formed and wrapped in a truly delectable package… the insistent piano opening that seems as if it wants to tear through the speakers, the drums emerging to echo the beat laid down by the piano before they both take a back seat to the vibrant harmonies on the chorus that kicks off the vocals. Most notable of all though is the sudden appearance of Ricks who closes out the opening refrain by himself before taking full control of the proceedings, a sound when he comes in that is still every bit as shocking now as it must’ve been then. His voice is a thick mixture of honey and molasses, melodically sweet but with a slow languorous delivery that pulls you in, and then pulls you under, almost hypnotizing you in the process. His presence dominates the record, slyly imparting the lyrics with more than a hint of lecherous intent, not toning down a thing for an ill-attempted stab at crossover pop appeal as black groups previously had done almost without fail. There was no mistaking this was black music for black audiences, another way at the time of saying this was rock music for rock audiences. 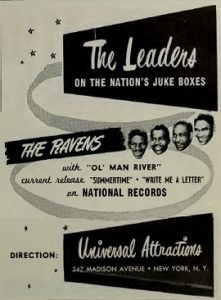 Whereas The Ink Spots, for all their brilliance, made sure to never alienate white adults, and courted them openly in fact, The Ravens almost seemed to be provoking those same white adults by boldly embodying the type of imagined leering sexual menace that society always feared if the shackles of Jim Crow were loosened too much. What stands out most though, beyond the startling voice of Ricks, is the arrangement which gives the hint of being almost taboo in nature yet is accomplished by simply playing with the perceptions of the audience. Ricks’ sleepy delivery mesmerizes, your eyelids grow heavy from the sound, but the stabbing piano interjections startle you back into full alertness. The two stop-time sections Ricks employs ramp up the suggestiveness without delivering anything off-color, unless of course you want to read something into the wordless moans he casually tosses in. They don’t seem sexual in nature yet you’re pardoned for thinking they are even if it’s only your imagination convincing you of something sinister lurking under the surface. Implying something that’s not quite there would be a hallmark of rock forever after. It’s not ALL Jimmy Ricks show however, as the soaring closing taken by the others decrying the mailman for not stopping at their door with a message from the girl in question (foreshadowing The Marvelettes 1961 chart topper Please, Mr. Postman more than a little) adds immeasurably to the feel, their trading off with Ricks’ interjections as it heads into the coda are invigorating, keeping the group spirit alive, giving the record buoyancy and leaving you with a feeling of being energized even though the pace of the song itself never gets out of second gear. Everything here plays off each other, contradictions abound – how the song can sound at once both decidedly slower and yet more uptempo than it actually is – and yet all it feels natural, almost organic in a sense. It’s clearly designed to highlight their various strengths yet it in no way calls undue attention to their plot to do so. Its appeal is subversive in the best tradition of subliminal advertising. The fact that this approach The Ravens took not only worked – connecting deeply with black listeners – but did so to such a degree that the record sold enough to cross over to the lower reaches of the pop charts, was a sign that this music that seemed so uncouth when compared to earlier forms had unexpected far-reaching appeal from the very start. Was it simply a case of curious white listeners sensing an unusual novelty of it, or more promisingly was it case of the growing economic power of the post-war, increasingly liberated younger black working class buying it in enough numbers to get it there entirely on their own? Either way Write Me A Letter heralded a new day musically. Nobody at this point knew of course, or could probably even conceive of just HOW far reaching it would turn out to be, but with the release of this record, coming on the heels of the commotion caused by some of the records we’ve already covered, astute listeners could sense that something worth getting excited about was not just ready to happen but was already underway. Most crucially however was rock music now had another weapon up its sleeve. By taking on this other dimension so early in its creation, and by reaching audiences in such a big way in the process, the entire genre now had a broader base from which to build. More variations on the basic initial models would quickly follow each giving rock an even wider foundation. No less important was the long shadow cast by The Ravens themselves as the music evolved. For the next twenty-five years The Ravens would exert considerable influence in rock vocal circles. The “bird group” phenomenon – with countless groups for the next dozen years being named in virtual tribute to these young men – was the most obvious nod to their imposing stature. But musically the effect was similar. The early Drifters with their brilliant tenor Clyde McPhatter and bass singer Bill Pinkney, and later The Temptations, particularly bass singer Melvin Franklin, were just two of The Ravens disciples of the first order. You could even credibly say that Public Enemy, with the deep baritone leads of Chuck D. paired with the high finely-tuned whine of Flavor Flav, were Ravens descendants in a way. That intrinsic connection, the way rock music as a whole has the ability to form a continuous line through the years linking each new step to something that came before so that the entire movement never loses its forward momentum, is what has allowed it to remain so vital for decades. So now step two of the building blocks rock needed were already firmly in place just a month into its life. Who knows, maybe this rock ‘n’ roll thing might catch on after all. Leave a reply on "The Ravens: “Write Me A Letter”"